Did you know that we officially launched our Develo Fact Pack last week? For only $9.90, you can now get the facts you should be aware of if you’re looking to start your search for your new home or if you’re about to start the planning process of your home renovation for a whole lot less. You might be wondering what the difference is between our original Property Search Report and our new Develo Fact Pack - well, the difference comes down to the title search. The Develo Fact Pack does not include a Title Search, whereas the Property Search Report does. So what exactly is a title search, you ask? Well, this post takes a deeper look into what it is, why it’s important for you to have the information given on a title search on the house you’re about to sign the contract on or the house you’re about to start renovating, and which Property Report is right for you. A title search is a document (Certificate of Title) which presents a person’s record of interests and rights affecting their land. The Certificate of Title is issued by the Registrar of Titles to the person entitled to it (eg. the registered proprietor or mortgagee). It shows the date it was created, plus all registrations and recordings made in the Register at the time. In Queensland, the title search is obtainable from the Department of Natural Resources and Mines at a cost. Why is a title search necessary for me? As the title search indicates the registered owner, it will indicate whether the seller has the rights to sell to the buyer, and show whether there are any restrictions or conditions on how the land can be used (such as encumbrances and easements). Buying a home isn’t a quick process - so imagine yourself finally looking over the contract of your dream home only to find out that The Crown holds some rights to the property that changes the plans you had initially wanted to accomplish. Not a nice surprise indeed - so that's where we come in. Which Develo Report is right for me? 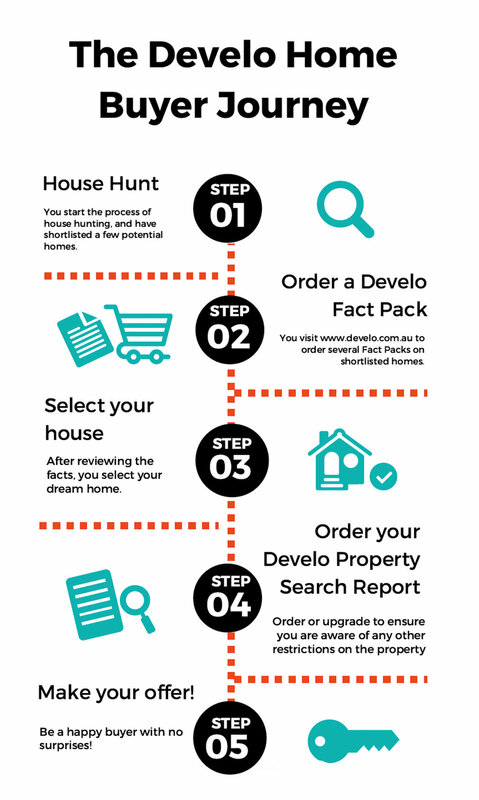 The Develo Fact Pack is perfect for those who are about to start or in the process of house hunting, and have shortlisted a few potential homes. Ordering a few of our Fact Pack’s will assist in making the decision on which homes to take the time to inspect, and consider purchasing. Just before making an offer on a house, it is recommended that you order a Develo Property Search Report to ensure that you get the facts before you sign the contract, to prevent any hidden surprises in the future. If a Develo Fact Pack has been purchased previously, it is simple to upgrade to the Property Search Report - just email our friendly team and we will be able to organise the additional information and package it just for you. Click to view a sample report of our Develo Fact Pack or our Develo Property Search Report. Have any more questions? Feel free to send us a message here and we will endeavour to reply as soon as possible.